Our community, living the principle that CHARACTER COUNTS! Why should we promote character? With the hurried lifestyles of today's families, youth can be influenced less by their families and more by media and individuals outside the home. It is our responsibility as citizens of this community to surround young people with positive images and values. If we don't like the choices youth are making, we need to look at the choices they are being shown. Character is developed through examples and practice. Workshops alone cannot instill high moral character and integrity in our youth. They need reinforcement from the community. 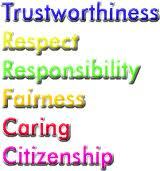 Youth need to see and hear positive values at home, at school and throughout the community. 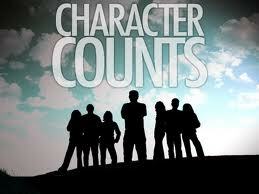 How Did CHARACTER COUNTS!® Begin in the Bloomingdale Area? The Citizens' Advisory Council for Bloomingdale School District 13 studied the topic of values education, taking into consideration the needs and common values of the Bloomingdale community. Council members found CHARACTER COUNTS! provides a means for involving, not only the schools, but the community as a whole, which they recognized as being essential to effectively promoting good character. After CHARACTER COUNTS! was approved by the School District 13 Board of Education, the major Bloomingdale governmental bodies, along with several community organizations joined efforts in this initiative. The Bloomingdale CHARACTER COUNTS!® Coalition is actively spreading the word to increase awareness and involvement.